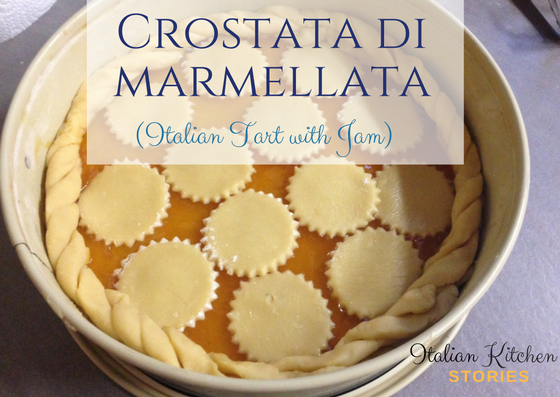 I love all kinds of crostata di marmellata and their versatility. You can make them with all kinds of jam and in all kinds of shapes. 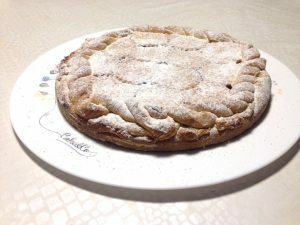 🙂 Big or small they are one of my favorite Italian desserts. 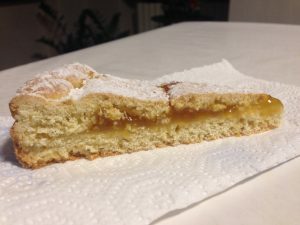 Typically the pastry for crostata di marmellata needs to rest in the fridge and when you are trying to form it later it brakes easily. Preparation of this tart was fast and fun. So let’s begin. Mix the egg and sugar until you get light yellow creamy texture with small bubbles. It needs to be airy. Add room temperature butter to the egg mix in small pieces and continue to blend. If the butter is too cold it will split in chunks that will blend harder. 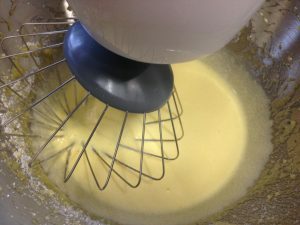 Once butter has mixed well add yogurt and continue mixing. I didn’t have plain yogurt at home so I have used peach flavored one as I was planning to add apricot jam as a filling. 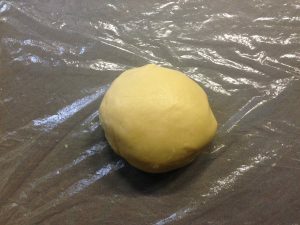 In a separate bowl sift flour and add baking powder and salt and mix them with a spoon, then add slowly to the egg mix. 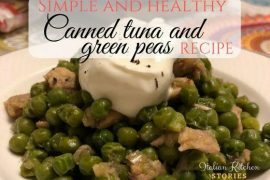 (Don’t add all the flour at once is it will not mix well with the rest of the ingredients. Work the ingredients until you get nice smooth texture doe. If you see that it sticks still add a bit of flour as you are working it in a bowl. Once it’s not sticking anymore on to the bowl take it out and put between 2 baking sheets or kitchen plastic wrap. In that way, you will be able to stretch it without sticky patches or breaking it. Take 1/3 of the doe and set aside for tart decoration. 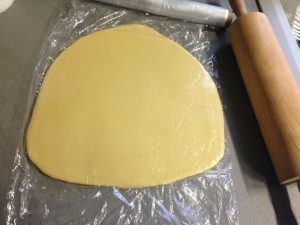 Take your rolling pin and flatten the remaining doe so that it would fit your baking tray. 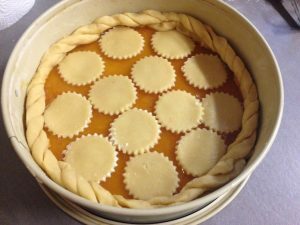 To bake this tart I have used spring pan, but you can use one of your choices. Before you place your down into your baking tray don’t forget to grease the pan and cover it with flour or you can just use baking paper. Place the doe inside the baking pan, remove the excess and use the fork to tap the bottom, creating small holes. Add the marmalade of your choice and make some decorations with the doe we have set aside. Use your imagination for whatever decorations you like.